I did not have much time in the sewing room today. I found just a little time to sort out my blacks to greys. I also allowed the bits of colour into my black. So some are kind of bright. I have lots of black and white so I will use some of them this month. 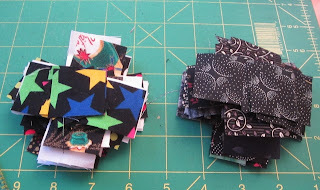 I started to kit up my spool blocks. I used the 1 1/2" strips for these. 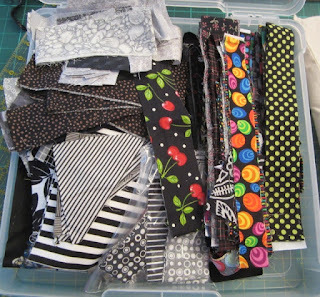 I am surprised how much black scrap fabrics I have. You do have a lot of black fabric. 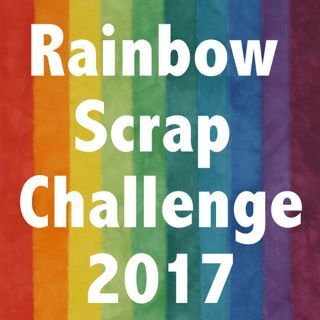 It will be fun seeing what comes out of that fun bin full of scraps. You should have fun with that container of bits this month.